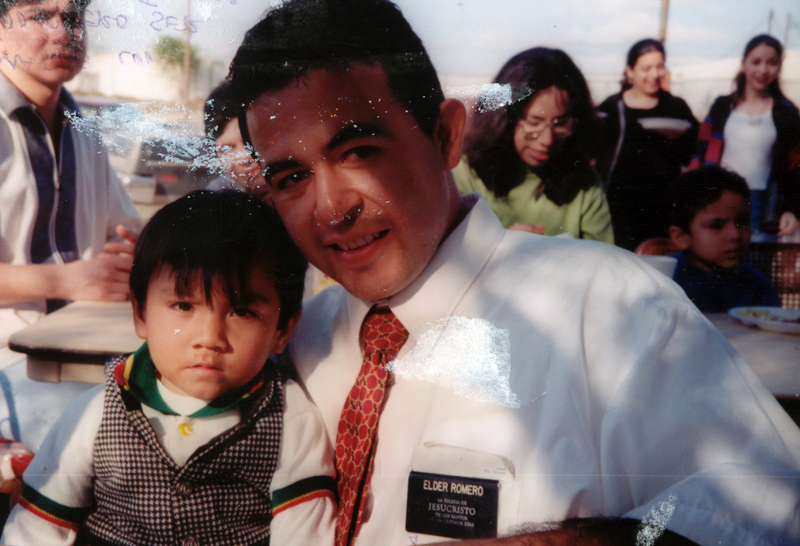 Elder Romero - Texas McAllen Mission 1997. Before spending two years a missionary for the Mormon church, I was timid about having religious conversations with anyone. This was particularly pronounced during my junior high school years. The Mormon church use to have a program where boys ages twelve through eighteen were paired up with their fathers once a month—typically on the first Saturday of the month—to collect donations from members of the local congregation. Kids whose dad was absent in the home—like me—were paired up with male adult members who didn’t have boys of their own or whose boys were too young. I didn’t mind doing it, but I was terrified that I would be spotted by my school friends in a white shirt and tie performing church duty. The Mormon church that I attended was in the same neighborhood where I attended school, so some Saturdays I faked being sick to not go. To this day I don’t know why or where I picked up the idea that church-going people were weak and ridiculous, and being found out by my friends that I was one of them (church-going) would have been terribly embarrassing to me. I learned to compartmentalize life and to not allow any overlap between my different roles early on. I couldn’t bare the thought of being discovered by my friends as a “Holly Roller.” At school I was a popular graffiti tagger, but on weekends I had a secret identity. I was a “Holly Roller.” On weekdays I was “cool”, I tagged public buses, I was funny, I didn’t put up with crap from anyone. But on Sundays I was “pure.” I prayed, I fasted, I read scriptures, I said things like “I know this church is true.” I was quiet and timid. I graduated from high school in 1992 and four years later I decided to fulfill my expected two-year duty to the Mormon church by serving a full-time mission. Missionary service marked the first of two changes in my religious point of view. As a Missionary I found that most people were not only willing to, but excited to share the most intimate details about their religious experience with me. For the majority it was comforting to speak about their belief in God, their feelings about church, morality, purity and salvation. When they spoke, they didn’t sound ridiculous and they didn’t appear weak. I was wrong to have thought so. I decided that I had compartmentalized my life the wrong way. I never felt the same urgency or excitement about serving a full-time mission as my friends did. Boys were expected to begin their Missionary service at nineteen, but at that age I found it hard to speak about religion with anyone still. So, I was twenty-two when I entered the Missionary Training Center in Provo Utah. If I could describe my religious point of view at this stage in life, I would describe it in terms of a house. My life was divided into different “rooms.” Church, spirituality and religiosity happened on Sundays in a specific room. There were other rooms in my life. There was a room where work life took place, another for school life, and yet another for my social life . There was a room for every different aspect of my life with no overlap between them. It made it easy for me to move from one area of responsibility to the next without needing to reconcile any discrepancies or resolve conflicts between them. I could record and be paid for unworked hours by my employer Monday through Friday and learn about honesty and integrity at church on Sunday without feeling guilt. …He (Christ) has chosen me to represent Him—to stand in His place, to say and do what He Himself would say and do… My voice is His voice, and my acts are His acts; my doctrine is His doctrine. My Commission is to do what He wants done; to say what He wants said; to be a living modern witness in word and in deed of the divinity of his great and marvelous Latter-day work. My life was a house made up of various rooms each with a specific purpose. Serving as a missionary didn’t stop me from compartmentalizing the same way, but it did changed the space in my life where religion happened. Religion use have a room of its own. Now religion happened in a common area—the kitchen. More specifically religion became the stew on the stove. It became the aroma and that aroma permitted every other room in the house. The Mormon church was the only true and living church on the face of the earth, restored through the hands of Joseph Smith. The Book of Mormon was a historical, ancient book written in a modified version of Hebrew and Egyptian by ancient holy men living in the American continent. The Book of Mormon had been translated by Joseph Smith through the power of God. Only within the Mormon church, the legitimate authority to pronounce blessings, interpret scripture, and issue proclamations in God’s name—the Priesthood—could be found. God had a physical body of flesh and bone. God was all-knowing, all-powerful and all-good. God’s love for me was such that He allowed Jesus to be put to death and that through His sacrifice I could repent of my sins and return to live with Him in heaven. God was involved in the most minute of my life’s details. From the most insignificant to the most important issues, God was literally experiencing life with me. I was never alone. Through prayer I could have a conversation with God. If I were attentive and keenly tuned, through prayer I could experience communion with God. It was a plan laid out from before the world was created, and became operational at Gethsemane and Golgotha. I was required to accept the sacrifice of Jesus on my behalf. I was required to be baptized by water (fully submerged by a male member of the Mormon church possessing authentic authority to do so), and by the Holy Ghost. Salvation entailed an eternity of indescribable joy for me and my family in the presence of God. Salvation was a lifelong process that had happened (see 1), was happening, and would ultimately happen at some point in the future. To borrow a metaphor from C.S. Lewis, the mechanics of salvation—faith and works—operated in a fashion similar to a pair of scissors. Morality is represented by a life that exhibits behavior in harmony with an individual’s religious convictions. Over the next eighteen to twenty years that followed I changed. The change was slow. It happened as the dew that forms on grass in the mornings. It was gradual and with such stealth that it was just short of invisible, but I changed almost everything that I believed about these three things; God, Salvation and Morality.